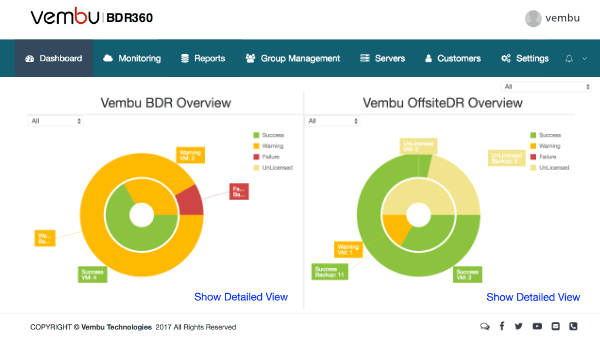 Vembu BDR Suite is designed to enable Managed Service Providers (MSPs), Cloud Service Providers (CSPs) and other Service Providers (ISPs and Hosting Providers) to provide backup and DR services to their clients at an affordable cost. Vembu BDR is a powerful, comprehensive and secure backup & DR software which is very easy to setup, configure and administer. Vembu BDR Suite offers a comprehensive and affordable Backup & Disaster Recovery (BDR) platform for Managed Service Providers, Managed Hosting Providers and other Solution / Service Providers to boost their customer base and revenues by enhancing their managed services offering to their business customers. Hierarchical Management Structure – Web portal enables all parties to have customizable “self-service” management access for their backup deployments. 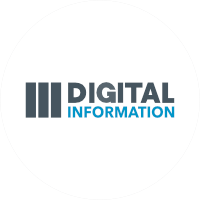 End-users can access and administer their backups, run restores, and download restored files through the management portal. Clustering & Load Balancing – BDR and OffsiteDR server installations can be configured into a cluster, and new backup servers can be dynamically added to handle increased loads. This ensures effective and reliable scalability, without affecting production environment. Multitenancy – You can provide access to the backup system by grouping the VMs and physical machines to your customers. So, each customer can manage the backup jobs and perform recovery when required. 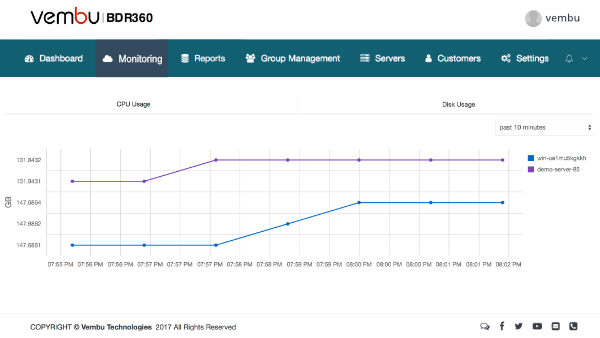 Advanced Reporting & Centralized Management – Increased reporting capabilities with events and alarms help service providers proactively monitor, identify, and manage problems when they develop from centralized management console. Vembu BDR enables service providers to offer an automated backup & DR services to SMB and Enterprise customers and is designed to be flexible to your deployment needs. Vembu BDR offers various deployment options to fit every backup scenario. In case customer need backup data to be stored at the customer premises, Vembu BDR backup server can be deployed in customer site and all the data will be backed up locally. So, the local backup data can be used to quickly recover the backed up VMs, physical machines or individual files when required. This scenario also, used by the Cloud Service Providers and Hosting Service Providers to provide BaaS and DRaaS. In case customer wants to replicate additional copy of backup data to cloud, service providers can use this deployment scenario. Using Vembu OffisteDR, service provider can set up the DR site in their data center or any public cloud such as AWS, Azure and etc. You could deploy Vembu BDR Backup Server in your own data center / co-lo and offer backup services to your business customers with client machines directly backing up over the Internet to a remote Vembu BDR Backup Server. In this case, customer can backup the File Servers, Microsoft Exchange, SQL, SharePoint, SystemState, Registry, Outlook, MySQL, Oracle, PostgreSQL, Linux machines and Mac directly to your data center over WAN. Disk Image Backup – For physical Windows servers, workstations and other VMs running in different hypervisors such as Xen, KVM and Oracle VirtualBox, you can install an agent inside the machine and backup entire machine. Image Level Backup for Windows Desktops and Laptops are absolutely FREE! File Backup – Vembu offers legacy backup solution to backup the important file/folders from Windows, Linux and Mac. Office 365 Backup – Protect Microsoft Office 365 account from ransomware by backing it up. “Vembu’s solution is simply the best backup solution we have ever come across. 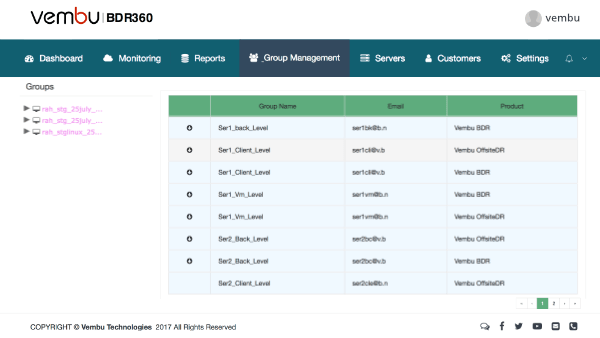 Extensive reports and centralized management console offered by Vembu for service providers to stay connected with their customers. Group the different backup environments, clients, VMs and physical machines and create user access to your customers to manage backup activities, get collective reports and alerts by themself. This will ensure easier management when their is a large environment where multiple administrators are responsible for backups. Configuration of automatic emails alerts upon backup completion with status and a summary report. Option to configure the e-mail alerts based on the Server/Client/Backup/VM group levels. Instant status for the backups with at-a-glance health status for backups, clients or backup environments. 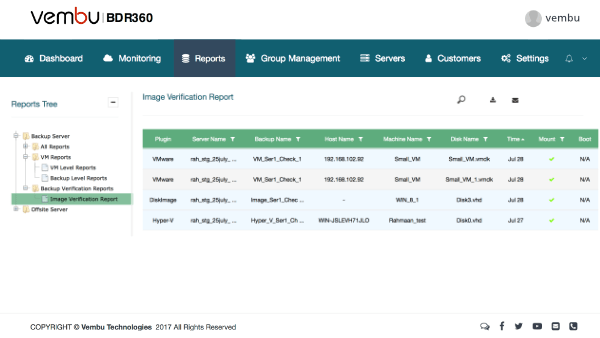 Get the backup verification report which will have the snapshot of the boot screen of the backed up VMs and physical machines.